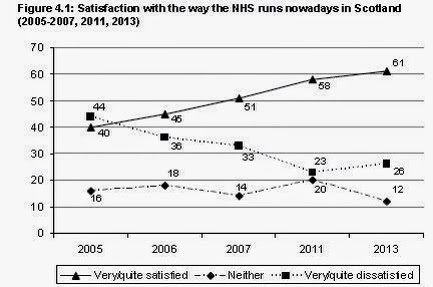 Public satisfaction with Scotland's NHS continues to rise, while support for privatisation falls. New findings from the Scottish Social Attitudes Survey (SSAS) 2013 have found satisfaction with Scotland’s NHS increased by over 20 per cent since 2005. The official survey of around 1500 Scots found that 61 per cent of people in Scotland were either very or quite satisfied with the NHS, compared with only 40 per cent in 2005. This high level of satisfaction is reflected in the patient experience as well. In last year’s Health and Care Experience Survey, 85 per cent of Scottish inpatients say their overall care and treatment was good or excellent, and 87 per cent also rated the overall care from their GP surgery as good or excellent too. Scots also continue to reject the marketisation of care. In this survey, the majority of people (59 per cent) also thought the government would provide better quality care services than the private sector. There has even been a drop in support for charities running care services. It was always low for hospitals and very low for the private sector. Private sector involvement in the NHS may be minimal in Scotland, but it is common in the social care sector, particularly residential and home care. This survey shows that opposition to the marketisation of health and care remains strong in Scotland and that most Scots believe that cooperation is the best way to run our NHS.